Former Vice President Al Gore made his exit from Sunday’s climate change march in New York City in a Chevrolet Suburban SUV after speaking to reporters about renewable energy. Gore asked a security officer, “You want me here?” before stepping into the SUV, which appears to be a Suburban LT model, as seen in a logo behind the passenger door Gore entered. It is unknown if the large Chevy SUV was a flex fuel vehicle. 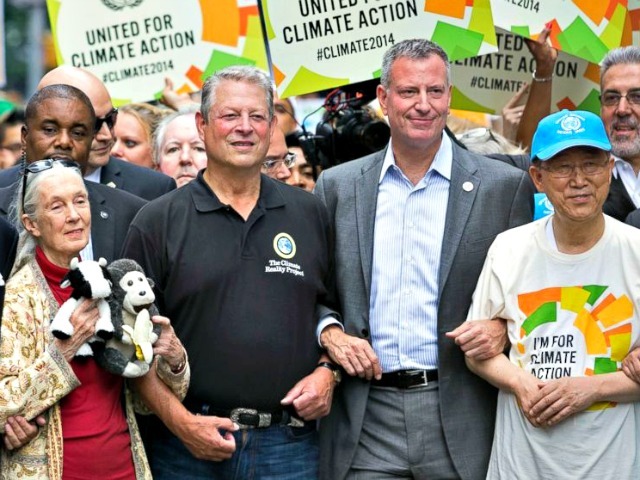 Gore marched with global warming protesters at the People’s Climate March along with Sen. Chuck Schumer (D-NY), New York Mayor Bill de Blasio, Sen. Bernie Sanders (D-VT), and United Nations Secretary-General Ban Ki Moon, among various celebrities. De Blasio praised Gore’s work during a press gaggle at the march. The march began at different locations in New York City, from the Upper East Side of Manhattan to Columbus Circle. Attendees walked to 11th Avenue and 34th street among gigantic puppets and costumed individuals demanding more stringent environmental regulations. Mayor de Blasio presented his plan, which he claims would cut carbon emissions 80 percent by 2050, that could include mandating private sector buildings to be retrofitted.